We are not just electricians at Mohrfeld Electric Inc., we are innovators. As technology and best practices continue to evolve, so do we. Our team works with owners and general contractors to ensure efficiency on projects from start to finish. The initial design for this project was to route all the feeder wiring from the electrical room to the plant equipment through a network of cable trays above the plant floor. The ceiling height being 40 foot tall, the cost of cable tray and wire was substantial. In an effort to lower project costs and save time, we proposed routing the feeders through conduits underground. 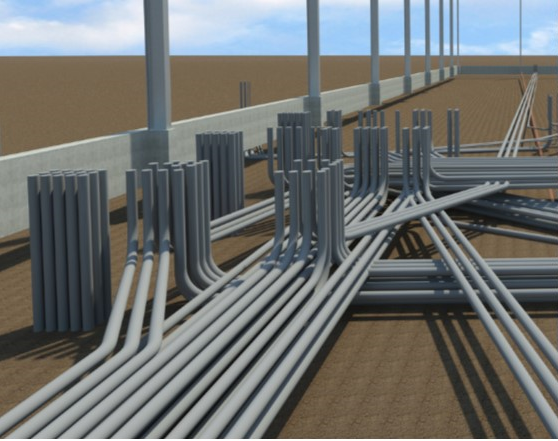 With nearly 200 conduits leaving the electrical room, having a proper design was critical. By eliminating the cable tray and reducing the length of the feeders we were able to shorten the construction schedule and save the owner more than $180,000. After the design stage, the layout information was imported into a Trimble Robotic Total Station and every aspect of the electrical room was laid out as the feeder conduits were installed. By installing the conduits in several different layers we avoided unnecessary bends in the conduits. Routing the feeders underground not only saved the owner time and money, they were left with a cleaner installation and plenty of overhead room for future expansion. We provide quality electrical services to residences and businesses alike.